A recent editorial in The Brown University Child and Adolescent Behavior Letter expresses frustration with the lengthy time gap between important scientific discoveries and the implementation of these discoveries in everyday practice. Dr. Gregory Fritz notes that the lag between research findings and changes in practice and behavior is often cited to be 17 years on the average, but that the disconnect is particularly egregious when it comes to what researchers know about the importance of sleep for adolescents and the actual amount of sleep that teenagers get. He refers to a 2014 Policy Statement from the American Academy of Pediatrics as evidence that the need for sleep is well-accepted in the pediatric community. The AAP Policy Statement and Dr. Fritz both point to early school start times as a major factor in sleep deprivation. We have written about this issue many times; in fact so often that it is impossible to include links to all relevant posts. Searching "sleep" in the list of blog topics will enable readers to locate all our posts on this subject. Research has demonstrated that the tendency for teens to stay up later is part of the changes in the level of the hormone melatonin that occur during puberty and continue through adolescence. When teens are able to compensate for this change by sleeping later in the morning, things tend to balance out. 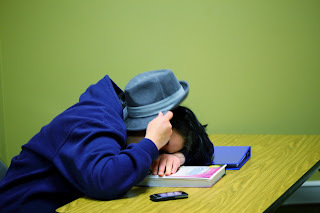 But, when teens have an early start time at school and they must get up before they have had the full amount of sleep needed for maximum functioning, their daytime function is impaired. Dr. Fritz notes that, "sleep-deprived adolescents tend to get lower grades and report higher rates of depressive symptoms," compared to those who get the optimal amount of sleep - close to nine hours. Particularly concerning is that there is a correlation between sleep deprived teens and auto accidents. When you consider that teens are inexperienced drivers, and you add in the impairment caused by drowsy driving, this is frightening. Dr. Fritz laments the failure of adults to take the available data seriously and to take steps to change the start times of school for teens. It may take some logistical maneuvering, but failure to make this a national priority is creating a generation of drowsy, inattentive- and possibly endangered - teens.